The age old question. 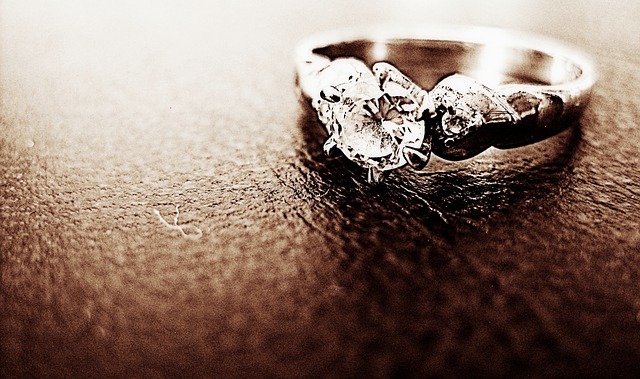 As long as there have been proposals, fluttering feelings of "is she the right one?" there have, at the same time been the less romantic technical questions on hand. Will this ring fit her? What if it doesn't fit? Will that be a bad omen? To solve most of these jewelry and engagement ring related queries, we have devised a system. One that can improve your chances at getting her finger size and style right on point. Decide your budget. How much do you want to spend on an engagement ring. Traditionally, they say, you should spend about 3 months of your annual salary on an engagement ring. But, that may not always be the best bet. Based on your budget, you will know how many carats you can expect to get. Prices can soar once you reach above the 1 carat diamond mark and can be significantly reduced, if you go for a 0.97 carat ring. Of course, if you're going all out, then ensure that you're getting the best quality ring for your budget. A diamond's cut, shape, size, color and grade all matter in determining its value. To speed up the process, there is an automation service which allows you to custom pick just the right diamond for you. The diamond can cost anywhere from $73 to $703,000. To begin this interactive process, click here and start learning more about the different types of diamonds available. If you are picking out your own diamond, go to a GIA certified or GIA graduated gemologist to get your diamond quality verified. We, at B2C Jewels have dedicated personal shoppers (GIA graduates) who will help you identify the right ring, shape, color and customization for your engagement ring at no additional cost. Many people feel they need to hold the piece before they purchase it and will avoid buying diamonds online. But with extra secure web servers and comfortable return policies, buying online is faster, easily customizable and you don't have to worry about the price, because as you will quickly see from your experience, online diamond buying is much more affordable than going to a traditional mom and pop shop. There are many more tidbits as far as choosing the color or the variations of diamonds, which we will get to soon. But if you can't wait, feel free to contact us right away.